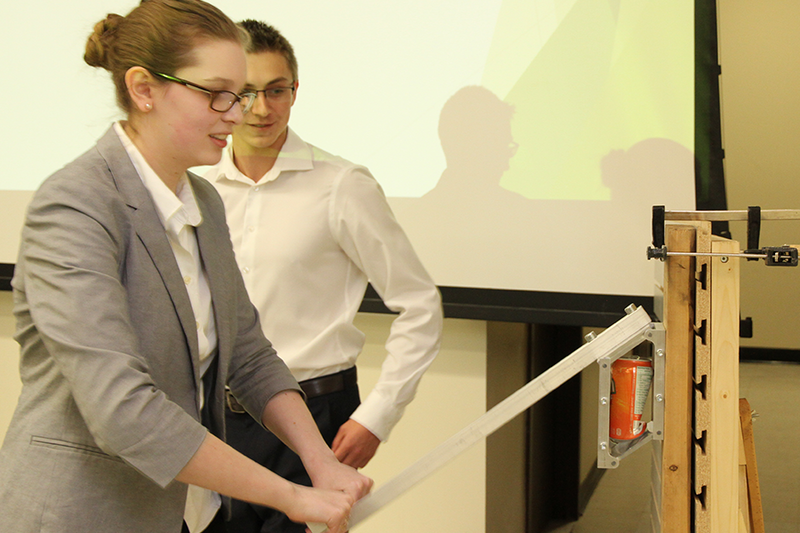 Students in Rick Retzlaff's third-year mechanical engineering class demonstrate their can crushing prototype on April 7. Rick Retzlaff believes good design should solve a problem. The mechanical engineering professor practices this ethos in his classes in the College of Engineering, where community and industry partners reap the benefits. The first class, Introduction to Mechanical Engineering Design, is a second-year class that guides students through the mechanical design process— from defining a problem to building a prototype. Last year, Retzlaff met with Dave Hunchak, a former colleague at the U of S who is now president of the Children's Discovery Museum. The museum, set to open in 2018 in the old Mendel Art Gallery space, was looking for exhibits for its current home in Market Mall. "We sat down last year and decided, ‘hey, let's turn this into a second-year design class,'" said Retzlaff. Student groups were tasked with creating simple, durable play stations using various physical phenomena—such as light, sound, shape, texture and colour—to captivate children aged three to five. However, there were some constraints in place. The units had a size limit, and had to be attached to a slotted wall with hardware. As these are being presented in a public space for children, ruggedness, cleanliness and aesthetics were important factors during the design process as well. Additionally, the exhibits had to conform to Health Canada's industry standards for toys, which Retzlaff described as "just a phenomenal exercise for the students to go through." Moreover, the small bureaucratic feat ensured overall safety for the young users. Retzlaff explained that it is important for each of the play stations to allow the physical manipulation of objects. This helps teach children about the physical phenomena in an open- end ay. "It's very much a design problem," he said. "It's all about human factors and strength and making sure nothing comes off. They need to draw things, come up with working models, then we manufacture it." Many of the groups (there were 20 in total) also incorporated some aspect of Indigenous knowledge into their design. For this purpose, Matthew Dunn, Indigenous initiatives co-ordinator in the College of Engineering, was involved in the design process. Retzlaff's other class, Collaborative Design and Manufacturing, is also about solving engineering design problems. However, there is a greater emphasis on group work for this third-year class. A common piece of feedback from industry, Retzlaff explained, is that students need more experience working together in large groups to accomplish tasks. "So we worked with that in mind and came up with this new class," he said. "It's all about groups working together to build a more complicated device—something complicated enough so that everyone needs to communicate and talk and work to put this thing together." He had been approached by Kevin Acton, the operations director of SARCAN Recycling, who suggested looking at a can crushing device. Currently, most devices on the market tasked with doing this crush the can top-down, resulting in an end product that looks like a thin aluminum hockey puck. However, this is not accepted by SARCAN for refund because it obstructs the label and cannot be further baled. "They need it crushed sideways. So that was the challenge we gave students," said Retzlaff. "Each smaller team is responsible for one part of the design. At the end of the day, they bolt it all together and they see if it works." To create the parts for their can crushing prototypes, student groups used two computer numerical control (CNC) lathe and mill machines, which were purchased through the college's advancement trust in 2015. The CNC machines work similarly to 3-D printers, but for harder materials (like aluminum) and moving parts. Students produce their parts for their fabrications in a specialized design program and feed it into the CNC machine, which creates that part. Just like the second- year class, there were certain constraints in place, explained Retzlaff. The flattened can had to be fewer than 10 millimetres thick and one side of the label had to remain readable. Additionally, the whole device must be operable by both children and adults. During the week of April 4, both classes presented their prototypes to their classmates and respective partner organizations, who are always happy to work with students on projects for solutions to real- world problems. And while presenting in front of their peers may be initially nerve-wracking, the involvement is a real boost for students to see their work in action. "They get to design and actually build things," he said. "It's not just a paper design class."